Squirrel Stopper Pro an ultimate bird feeder pole that's truly a Squirrel Stopper. This Bird Feeder Pole with its Squirrel Stopper baffle effectively stops squirrels and makes a squirrel proof bird feeder system. It is the large black pole baffle (28 in. long inverted cone) that stops squirrels and raccoons from climbing up the pole. It stops them before they can get to your bird feeders. 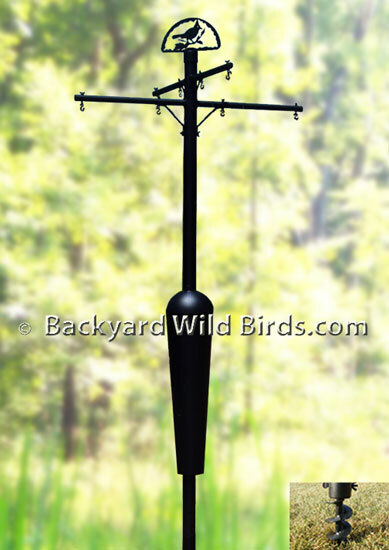 With this Squirrel Stopper Pole you can feed the birds without feeding the squirrels or the raccoons! Impressively strong heavy duty pole design is 8 ft tall above the ground with two 3 ft wide across strong hanger arms. These make 4 arms that are each 18" long with 4 main hooks. It also has 4 inner hooks for small bird feeders. Main support pole is 2" outside diameter and 1" diameter cross poles with eye bolts. Assembles in minutes without tools with twist and lock fit! The pole includes an attachable auger to allow for easy installation in any type of ground. Hang large dome all weather baffles, any style bird feeders or hanging plants. Durable steel construction - rust resistant with 16 gauge powder coated steel tubes. Put this capable system to work for you! We purchased the Squirrel Stopper Pro with some skepticism but after seeing the critters trying to climb up the pole and actually giving up is proof enough. The squirrels do not even try anymore to climb the feeder pole and I'm sure our birds appreciate it. Also, I know I am not having to replenish the feeders so often. Great product and I would recommend it to anyone.